Brian and Kendra have been married over 27 years, and have been coming to the Smoky Mountains for the last eight years or so. We are 'car people' and so in the beginning we came with friends to the Hot Rod show each September. In no time, we found ourselves coming for long weekends for other events. Our love for the area has grown and so we have targeted the Smoky Mountains as the place we want to retire. So, while mowing the lawn one summer afternoon, Brian wonders about property in Gatlinburg. Well, one thing leads to another and now 'Heavenly View' is our home away from home. Shortly after completely remodleing Heavenly View we new we wanted to purchase a second cabin. That started the search for Heavenly Escape. After the purchase and a total update Heavenly Escape is ready to enjoy. We wanted a comfortable get away that is conveniently located, easily accessible, with plenty of space and a gorgeous view. We like being in the mountains in a cabin yet close to shopping, restaurants, grocery store, etc. This cabin completely fit the bill. The view is awesome. 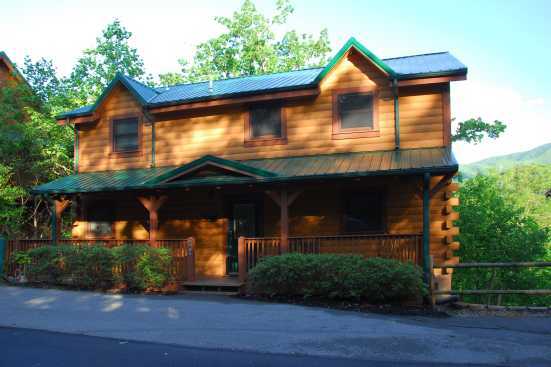 The cabin is equipped with plenty of entertainment and WiFi. And, the cabin has new furnishings and a brand new lower level.